Not only is Frank Gehry's architectural masterpiece quite fascinating, the newly opened Fondation Louis Vuitton provokes an entire range of adjectives. Engaging, amusing and awe-inspiring are some of the descriptions that swirled around in my mind as I explored the building during the pre-opening on Friday. Admittedly, aerial photos of the billowing building taken during its construction had me convinced that the structure more closely resembled an exploded mattress than a sailboat. I wasn't a fan. It was only when I saw the luminous structure from the second floor of the Eiffel Tower that I began to understand Gehry's vision. From afar, the luminous building appears to be majestically navigating its way through the tree line of the Bois de Boulogne. The modern skyscrapers of La Défense, the major business district of Paris, provide a stunning backdrop for its 12 silver, glass and aluminum sails. The contemporary art museum, which officially opened today, is even more captivating once you're inside. Visitors are encouraged to explore, get lost and wander from the 11 indoor galleries to the numerous outdoor terraces. Olafur Eliasson's Grotto, a monumental installation composed of forty-three triangular columns of various widths, produces an intriguing challenge for visitors wishing to capture the experience on film. I could have happily spent a couple of hours snapping pictures of the reflecting pool and the mosaics created by the yellow glass but there were still five more floors to visit. At a reported cost of 107 million euros, construction of the private museum has taken more than six years. Taryn Simon's A Polite Fiction, which comes with a warning that certain elements may shock the young public, reveals secrets hidden in the walls of Frank Gehry's architectural masterpiece by those who built it. In 2013, the artist started interviewing various tradesman who confessed that they had left a pack of Marlboro Lights with one cigarette, a used condom or a ham and cheese sandwich behind the drywall. Their stories provide an amusing yet compelling anthropological study of some of the people involved in this exceptional adventure. Gazing at the Eiffel Tower perfectly framed by the building's glass sails, my niece revealed how humbled she felt by Gehry's design. A newly graduated architect, Charline said that while she is passionate about her profession, she realizes that there are very few people who have the ability to turn a flurry of sketches produced during an 11-hour flight to California into such a unique architectural experience. 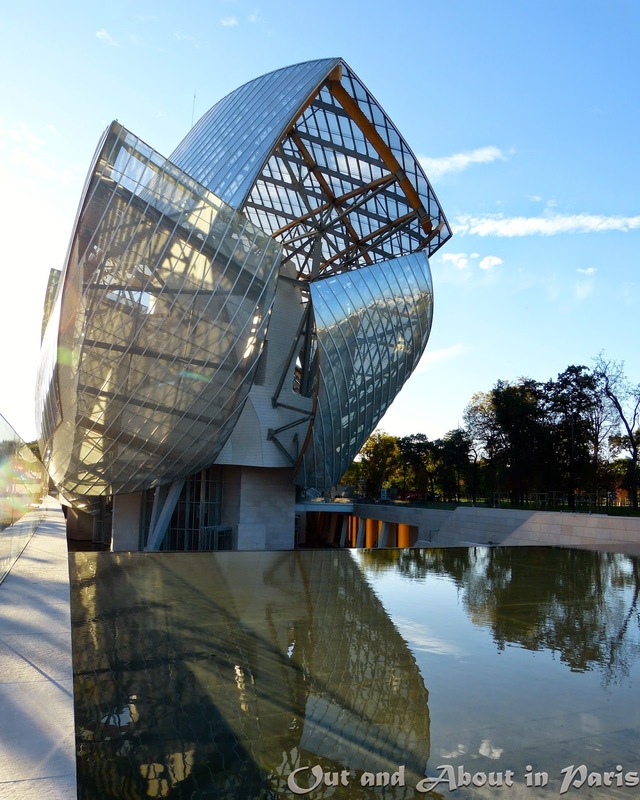 Yet, if any building can inspire dreams, it's Frank Gehry's Fondation Louis Vuitton. Open every day from 10:00 am to 8:00 pm. Friday late-night opening until 11:00 pm. Please click here to see the complete album of photos. So cool. Definitely on my "must do" list for next month! Wow, that is an eye-popping building! I'm glad they allow photography so you could bring us these excellent images. By the way, I'm intrigued by the dial-a-poem piece. Did you dial-a-poem?